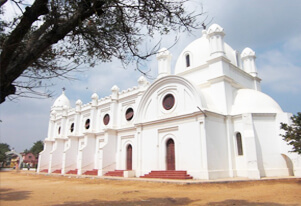 South India boasts some of the most stunning churches in India. Mostly built during the colonial era these Christian places of worship are not only divine but has architectural grandeur unlike other. In our 7N/8D Church Tour in South India, we will take you to some extremely sacred and architecturally spectacular churches. Ensuring that each church is given full time to be explored and that the essence of spirituality is not missed. Our tour begins with Chennai, where one of the oldest churches in India, Santhome Cathedral is situated. Praying at the feet of Saint Thomas, who is believed to have been buried here, we shall pay homage to other important churches in Chennai like St. Mary’s and St. George Cathedral. While in South India, one cannot miss out on Velankanni Church that is known to have magical healing powers. A grand white church in Gothic Style, Velankanni is situated a short distance from Thanjavur. In order to get the most of this tour, we shall include the Temple City of Madurai, from where we will head out for Kerala’s capital city Trivandrum. 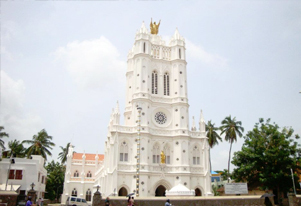 The city is the home to thre holy churches, namely St. Joseph’s Cathedral, CSI Christ Church and Vettucaud Church. We shall also bow our heads in the churches of Kottayam like Syrian Christian community and Valia Palli, Cheria Palli and St. Mary’s Church. Our journey will conclude with the blessings of St.Francis at Cochin, where we shall also take a leisure city tour.